Natural Resources tourism, arable land, agriculrural products. COMOROS IS ONE of the world’s poorest, and also most politically unstable countries. 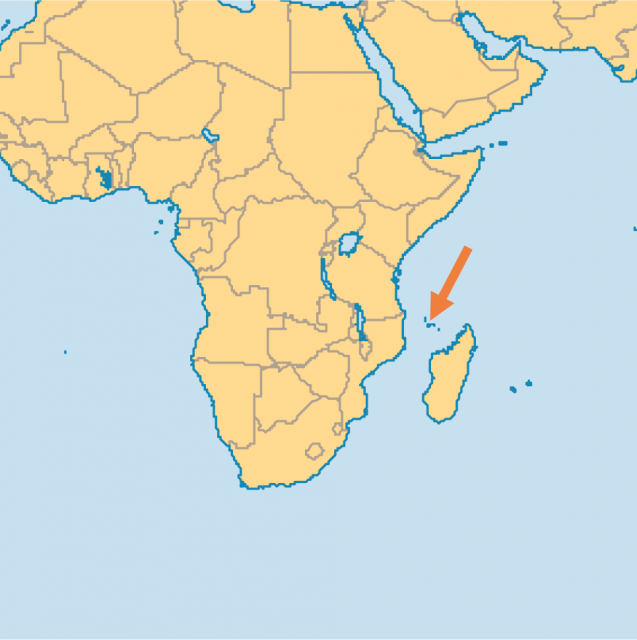 Located off the east coast of Africa, at the northern end of the MOZAMBIQUE CHANNEL, the Comoros developed under the mixed cultural influences of the Arab and East African world, plus European colonialism in the 19th century. The island group consists of Njazidja (also known as Grande Comore), the largest, with the capital of Moroni, plus the smaller islands of Mwali (Mohéli) and Nzwani (Anjouan). A fourth island, Mahoré (Mayotte), has retained its administrative links with FRANCE, despite intense local and international pressure. The islands have suffered from nearly 20 coups since independence in 1975, and further disintegration was heralded by proclamations of independence by two other islands, Mwali and Nzwani, in 1997. But a new attempt at compromise, promising a greater degree of local autonomy, was signed in 2001. The islands of the Comoros are volcanic in origin and of varying ages. The most recently formed, Njazidja, has two major volcanoes, the extinct La Grille in the north (3,300 ft or 1,000 m), and Kartala in the south (7,791 ft or 2,361 m), which last erupted in 1977. Nzwani and Mwali are geologically older, and have had time to form a richer soil from erosion and weathering. Most of the islands were formerly covered in lush tropical vegetation, and Nzwani and Mahoré have extensive coral reefs; both forests and reefs provide rich habitat for rare and interesting wildlife, such as the Livingstone fruit bat, the world’s largest bat, with a wingspan of up to 6.6 ft (2 m), and the coelacanth fish, the “living fossil” with limblike fins, thought to have been extinct for 70 million years until its rediscovery in 1938. Located on the TRADE ROUTES between the Arab world and East Africa, the islands were named by early Arab geographers kamar or kumr, meaning “moon.” Early immigration from southeast Asia to MADAGASCAR left a small Malayo-Indonesian population, followed by immigrants from the East African coast, then settlements of Arab traders known as the Shirazi from the 15th century. This mixture of Malay, Arab, and African ethnic groups created the unique culture of the Comoros today and continues to manifest itself in strong ties to various states of the INDIAN OCEAN basin. The Shirazi Arabs set themselves up as rulers and divided the islands into numerous sultanates. For many years they controlled much of the slave trade from east Africa to French plantations in Madagascar, MAURITIUS, and Réunion Island. Internal conflicts led to French occupation, first on Mahoré in 1841, then gradually over the other islands. The last sultan abdicated in 1912, and the islands became a formal part of the French colony of Madagascar until 1946. Internal self-rule was granted in 1961, followed by a referendum in 1974, in which 95 percent of the population voted for independence, but not on Mahoré, where 65 percent voted to remain part of France. This conflict, and the struggle between socialist and conservative Islamic groups, has resulted in the high political instability over the past four decades. Economically, colonialism wrecked the Comoros, creating a system of near complete dependence on products not suitable for domestic consumption. After slavery was banned in French colonies in 1848, planters turned the islands into exclusive zones for rare tropical products, especially ylang-ylang (used in perfumes and soaps) and vanilla. The Comoros remains the world’s largest producer of these two products, but is unable to feed itself and relies heavily on foreign aid, mostly from France, but increasingly from conservative Islamic states in the PERSIAN GULF. Islamic ties are strong, stressed in the official name, the Federal Islamic Republic of the Comoros, and symbolized by the crescent moon (from the name of the country) used in the country’s flag, which also stresses the desire for unity among all of the islands, depicting four stars, rather than three.